Hanoi (VNA) – Vietnam posted a trade surplus of nearly 430 million USD in the second half of July, after many consecutive months of deficit. According to the General Department of Customs, from July 16-31, the country’s total export turnover reached 9.41 billion USD, up 14.1 percent compared to the first half of this month. Meanwhile, total imports were valued at 8.98 billion USD, a rise of 6.5 percent compared with the figure in the month’s first half. Taking into account the trade surplus in the second half of July, Vietnam ran a trade deficit of 2.53 billion USD in the first seven months of 2017, equal to 2.2 percent of the total export turnover. 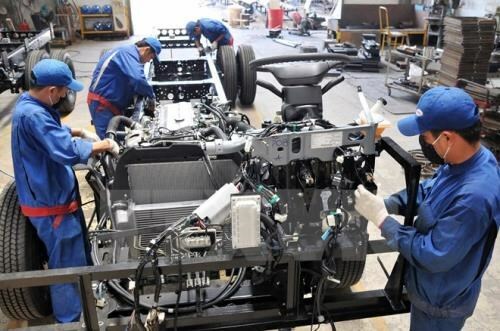 Deputy Minister of Industry and Trade Do Thang Hai said trade deficit was high in the first months of the year as major businesses such as Samsung, Electricity of Vietnam (EVN), and Viettel Group imported machinery, equipment and materials to expand their operations. After that, when the projects finish disbursement, trade deficit is seeing a downtrend, Hai added. According to him, the latest trade surplus was the result of efforts Vietnam made to step up export. Growth was seen in almost all markets and leading commodities. Vietnam is likely to gross a total export turnover of 200 billion USD for the whole year, surging over 13 percent from last year and exceeding the set target, Hai stated in a recent press conference. Meanwhile, imports are forecast to reach 205 billion USD, up 17 percent year-on-year.